Robert and I recently spent a few days backpacking at an amazing and somewhat secretive location. It was a tough hike over boulders and steep slopes with barely a trail to follow, but we were rewarded with absolute solitude, perfect weather and, of course, delicious homemade meals! Each trip to the woods gives me the opportunity to develop a new backpacking recipe or two. This time, I decided to make a curried dal. For this recipe, I started off with Taste Adventure’s Sweet Corn Chowder mix which is available in bulk at my local co-op. Despite the name, this soup really doesn’t have much in common with chowder. In fact, the primary ingredient is not cream or corn but dried yellow split peas. This made it an ideal base for my curried dal. To add bulk, I combined the corn chowder mix with some instant rice. Because the soup mix was essentially unflavored (seasoned only with salt, pepper and parsley,) I added in some curry powder and a touch of cayenne pepper for heat. Also, because I love it and thought it would add just the right amount of richness to the dish, I threw in some ground coconut (for this, I simply powdered unsweetened coconut flakes in my food processor.) I wanted to include some vegetables for texture, but I didn’t have time to dehydrate my own. To remedy this, I bought a packet of Just Veggies which is a colorful blend of dried peas, carrots, corn, bell peppers and tomatoes. Finally, for a garnish, I chopped up some roasted cashews. By preparing my own backpacking meals, I get the satisfaction of making delicious and nutritious food as well as the added bonus of saving some money. Commercial backpacking meals are typically very expensive. Just Veggies, dried coconut and roasted cashews aren’t the cheapest of foods so I’m not sure this meal really saved me any money. Still, I was able to tailor the recipe to my exact tastes, and it’s always fun to figure out how to make gourmet food that is lightweight, packable and easy to prepare in the wilderness (all of my backpacking meals are designed to be made in one pot with minimal effort.) The extra expense was worth it in the end. This meal was incredibly hearty and full of flavor. It proved to be one of the tastiest dinners I’ve ever eaten in the back country – a perfect meal to end a wonderful trip! Robert and I just returned from a great backpacking trip on the Washington Coast. The weather wasn’t the best, but we had the whole beach to ourselves for most of the trip – just us and the seals staring back and forth at each other! Nothing beats the sense of peace & relaxation that a few days in the wilderness provides. That said, one of my absolute favorite things about backpacking is getting to play kitchen scientist when it comes to meal planning. Each trip gives me a chance to develop and test a new recipe or two. The goal is always to come up with food that is tasty yet extremely lightweight and easy to prepare in the back country. This year, I decided to try my hand at making ham & bean soup. 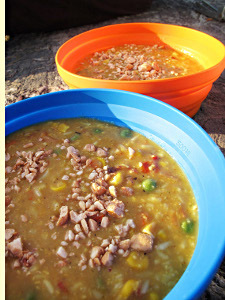 My mom used to make this when we would backpack as a family many years ago, and she told me recently that it was always one of her favorites – the ultimate comfort food for when you are deep in the wilderness. After a little bit of experimentation, I achieved good results. By dehydrating the soup in the oven, I was able to transform five cups of soup into a mere six ounces. It re-hydrated beautifully at camp and – mom was right – the soup was delicious! It was awfully cold & blustery during our trip but, sitting on the beach next to a roaring fire with a bowl of hearty ham & bean soup, we didn’t mind the weather one bit! Robert and I just got back from our first backpacking trip of the season. We headed up to Lake Caroline in the Wenatchee National Forest. I wish I could say we had a great time, but, unfortunately, the mosquitoes had made it their goal to cause us misery. I have never seen such ruthless bugs! They were so bad at Lake Caroline that we decided to climb higher and higher into the mountains, hoping to find a windier, bug-free spot. No luck. We found wind and colder temperatures, but just as many mosquitoes. Even our 100% DEET wasn’t enough to keep them at bay. We ended up packing our things early the next morning and heading home, a day earlier than expected. Oh well, things can’t always be perfect. That’s the risk you take when you go into the backcountry. Robert and I have really good luck with backpacking up until now so we were probably due for a less than ideal trip. At least, this trip afforded me the opportunity to try out a new backpacking recipe. 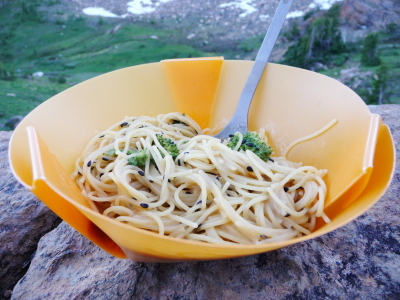 This time I made “Alpine Peanut Noodles.” This recipes features angel hair pasta and my signature dehydrated broccoli in a spicy Asian peanut sauce. Black sesame seeds add an exotic touch – a little bit of gourmet while you’re out in the mountains! Weighing in at 12 ounces, this meal is bit heavier than I prefer for backpacking. After the exhaustive climb we did on Sunday, I am more motivated than ever to make my meals as lightweight as possible (without having to resort to commercial, freeze-dried camping dinners – blech!) That said, my Alpine Peanut Noodles were worth the extra weight. They were spicy and filling, just what you need after a long, hard day of hiking. It’s just too bad we couldn’t enjoy the meal thanks to the swarms of mosquitoes making a meal out of us! Robert and I just returned from a wonderful backpacking trip to Sprite Lake via Paddy Go Easy Pass. It was a pretty steep climb, but the beautiful scenery, complete solitude and (mostly) nice weather was the perfect reward. We spent most of the trip reading our books, watching the playful chipmunks and listening to the pikas make their strange beeping sounds. Foodwise, I was pretty lazy and packed a couple of quick, no-brainer meals. Although it wasn’t gourmet, we still managed to eat pretty well during the trip. We had frito pie one night (of course) and Mary Jane Farm Organic Couscous & Lentil Curry the next which, as far as packaged food goes, is actually really good. Since it is always nice to have something fresh with your jerky and dried fruit and crackers, I packed a couple of CSA nectarines which held up surprisingly well. I also found these beautiful huckleberries growing near the lake which we ate as a morning snack with coffee and homemade zucchini bread. 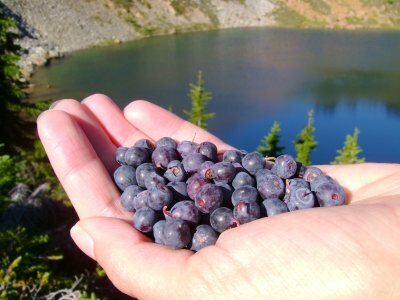 I can think of few things that are better than waking up in the mountains to the sunrise and a handful of freshly-picked wild huckleberries! Robert and I just returned from a fantastic backpacking trip to Toleak Point, located on Washington’s beautiful Olympic Coast. My family used to backpack at Toleak Point every year when I was little, and it was always my favorite place to go. Unlike most modern coastal areas, which are typically lined with hotels and tourist traps, the Olympic Coast is made up of natural, protected wilderness. Rocky headlands, dense forest, rugged beaches, tidepools and creepy off shore sea stacks are the name of the game here. Hiking on the Olympic Coast usually means scrambling up steep, unstable cliffs and over giant, slippery rocks in order to get where you are going. A tide chart is a necessity in order to avoid getting trapped between impassable headlands. But, once you arrive at your destination, you are rewarded with some of the most beautiful, pristine wilderness in the United States. Although the coastline is always changing, everything at Toleak Point was basically the same as I remembered. In a way, I felt like I had been there just yesterday (20 years can really fly by!) We saw plenty of wildlife including seals, bunnies, starfish, sea anemones, blue herons, bald eagles and a family of river otters who would come out to play in the ocean twice a day (the river otters were there when I was a kid too, so I was glad to see that they were still around.) The weather was very kind to us – no rain! A huge heatwave hit Washington State during our trip so, even though it was pretty sweltering out at the coast, it was still a much better place to be than in the city. We were lucky to have a giant ocean to cool off in. Mostly, we spent our time sitting in the sand reading our books or staring out at the water. I may love my computer and TV, but you really can’t beat the Pacific Ocean for entertainment. Robert’s well-crafted campfires provided lots of entertainment as well. As for the food? Well, my kitchen experiments last month really paid off because our dinners were all excellent! Of course, food always tastes so much better when your have dirt on your face and sand between your toes. Breakfasts and lunches were pretty standard fare: logan bread and oatmeal for breakfast and peanut butter, crackers, dried fruit and snacks for lunch. The dinners were the real highlight. The first night, I made frito pie, Robert’s favorite. It was just as good as it was during our last backpacking trip, if not better. 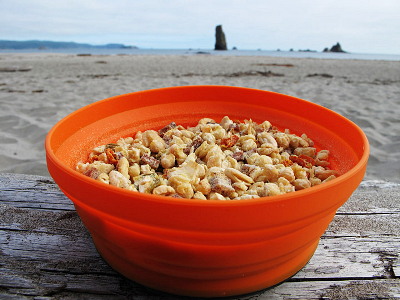 At this point, I don’t know if I’ll be able to go on a backpacking trip without bringing along frito pie fixings. 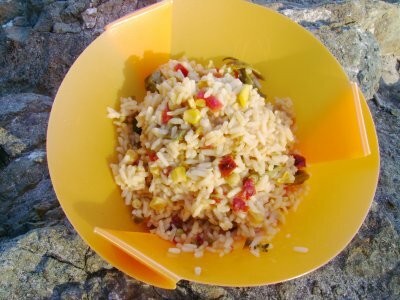 It is perfect camping food – spicy, filling and lightweight! My tuna & broccoli pasta was good, although, out of fear of starvation, I added more pasta than my own recipe called for, and we had a really hard time finishing it. I suppose being too full is better than going hungry, however. My final dinner was the result of another kitchen experiment: Vegetable Jambalaya. This dish was just OK when I tested it at home, but I doctored the recipe a bit and it ended up being completely delicious out at the beach. I combined instant rice with corn, okra, green beans and red bell pepper (that I dehydrated at home in my oven.) Green chilies, sun-dried tomatoes and spices add flavor. Robert and I are going backpacking next month so I am currently in hyper meal-planning mode. This means lots of experiments in the kitchen. I feel like a mad scientist, busy figuring out ways to make food more lightweight and packable yet tasty and nutritious. Sure, I could just head down to REI and buy some commercially prepared instant meals, but that wouldn’t be very much fun, would it? One of the main challenges with backpacking is getting your daily requirement of veggies. You could theoretically carry fresh carrots or other sturdy vegetables with you but, after a day or so they won’t be very good. Plus, fresh vegetables weigh a lot, and weight is always a big issue when you are backpacking. You could fork over the cash and buy dehydrated vegetables from Just Tomatoes. Or, you could buy a home dehydrator which you will use once a year and then need to find space for in your storage closet the rest of the time. But, most people do what I do – simply go without, relying instead on dried fruit and instant beans in place of vegetables. A few days without vegetables isn’t going to hurt you. Still, I just don’t feel right if there isn’t something green on my dinner plate. Robert and I have returned safe and sound from our backpacking trip to Rachel Lake. It was mostly a success except for almost freezing to death the first night thanks to a fierce, icy wind coming off the lake. I had on a T-shirt, long underwear, fleece, raincoat and gloves that night and was still shivering. It was sunny and warm the rest of the time, though, resulting in a pleasant and relaxing trip. No bears to be seen (dang!) but plenty of deer, chipmunks, camp robber jays and one shockingly loud marmot. You can find photos from our trip here. Here is the food rundown: The first night, we had tuna fillets (Starkist pouches), gravy and instant mashed potatoes which I spiked with parmesan cheese and olive oil. It was okay but the freezing wind turned our dinner cold almost instantly so that was a bummer. But, the frito pie on the second night was perfect! Instead of bothering with a roux and then adding ingredients separately, I just threw it all in together and it was ready in minutes. The spiciness of the chili really warmed us up. Lunches consisted mainly of snacks: trail mix, peanut butter, summer sausage, crackers, etc. For breakfast, I made homemade instant oatmeal packets using quick-cooking rolled oats (I pureed some in a blender to act as a thickener), powdered milk, brown sugar and dehydrated strawberries from Trader Joe’s. Also for breakfast, I made logan bread which my mom always used to make when we would backpack as a family. The logan bread was fantastic with coffee. You can find the recipe that I used here. I replaced the raisins with dried cranberries and dried apricots and I added more than the recipe calls for. We also brought a lime and some tequila minis and had “margaritas” while sitting on a sunny rock down by the lake one afternoon. I’m not sure if life can get any better than that! Robert and I are going backpacking in a few weeks so I have been busy planning what we are going to eat during our trip. My main goals are to keep the cost, preparation and weight to a minimum while still having meals that we enjoy. Robert suggested frito pie. For those that don’t know, frito pie is a New Mexican dish that, at its simplest, is a bowl of fritos topped with chili and usually some chopped onions and cheese. Last night, I performed a little frito pie experiment. I was able to stick fairly closely to my normal recipe with a few modifications for wilderness cooking. First, I made a quick roux of flour and oil. I found a tiny bottle of oil at Cost Plus so I figured it wouldn’t be too much trouble to bring that and a tablespoon of flour. Next, I added water and a blend of red chili, cumin, oregano, onion granules, garlic granules and salt. Normally I would use fresh onion and garlic but it’s added weight. I don’t want to have to do any chopping and I really don’t want to smell like onions in the woods. I don’t know if bears are attracted to people that smell like onions but I’m not going to risk it. I will not be bringing a whisk (only a spoon) so I was very happy that I didn’t get lumps when I added the water. In place of tomatoes, I added some tomato paste. Later, though, I read that tomato paste needs to be refrigerated. I’m not going to bring a whole, unopened tube so I think I will either leave it out or use ketchup instead since you can get those small packets of ketchup at fast food restaurants. Ketchup would make it a pretty ghetto frito pie (as if frito pie could get any more ghetto!) After simmering for a few minutes, I added some instant black beans and texturized vegetable protein. These are low in fat, high in protein and extremely lightweight to carry. They also helped to thicken the chili. Overall, it was a success and, if I liked it at home, I know it will taste great in the mountains. Next week I will be performing a tuna noodle experiment!